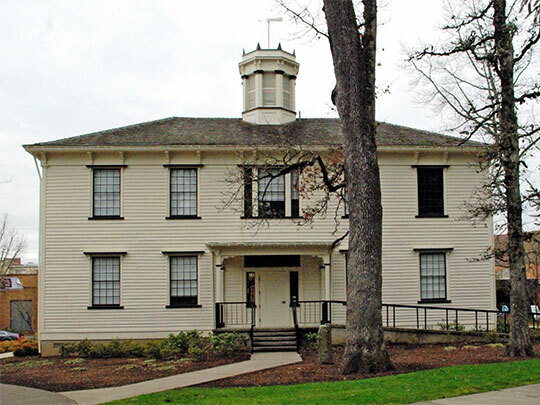 Photo: Old College Hall, Tualatin Academy, ca. 1850, 2043 College Way, Forest Grove, OR. Listed on the National Register of Historic Places in 1974. Photographed by User:Aboutmovies (own work), 2009, [cc-by-3.0 (creativecommons.org/licenses/by/3.0)], via Wikimedia Commons, accessed August, 2013. The Washington County Courthouse is located at 150 North First Avenue, Hillsboro, OR 97124; the main courthouse entrance is at 145 NE 2nd Avenue; phone: 503-846-8888. Washington County, created in 1843, is one of the four original counties created in Oregon. It was first known as Tualaty County but the name was changed in 1849 in honor of President George Washington. Workers of the Writers' Program, Works Progress Administration, State of Oregon, Oregon: End of the Trail, American Guide Series, 1940, Oregon State Board of Control, Binfords & Mort, Portland.